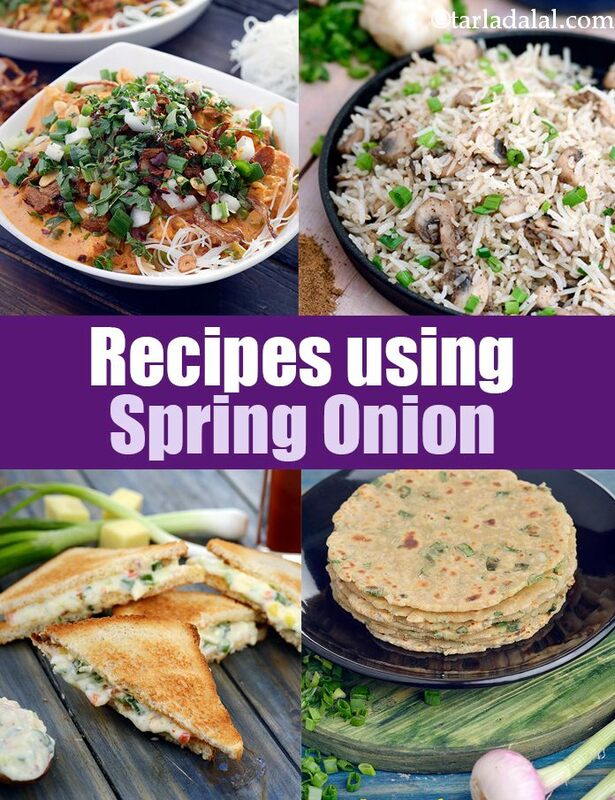 Spring onion recipes collection. Spring onions have a very unique taste which goes well with an array of vegetables. Not only is the white bulbous part used but also the leafy green part which is used as a garnish and in cooking. Other than being used in Indian cuisine, it is a major component in Mexican and Asian cuisine. It can be added to dals, or over salads to get an extra crunch. The winning combination of mushrooms and crunch of spring onions combined with cheese makes for a great Panini sandwich, making Mushroom Cheese and Spring Onions Panini a hit for all. An oriental variation of the classic Panini is the Chinese Panini with fried noodles, Chinese sauces and spring onions. Adding spring onions to any sandwich gives a nice textural component to it as well as it has done in Rajma and cheese grilled recipe. Another basic ingredient that goes well with spring onions is cheese, making the Cheese and Spring onion Sandwich a win for all! Being one of the most common ingredients in the Chinese cuisine, it is no doubt used in almost all their dishes. In the same way, the ever popular Indo-Chinese cuisine also uses spring onions the same way. May it be the classic dishes like Hakka Noodles or Schezwan fried rice where it is used for its unique bright and pungent flavor. Along with other Chinese classics like soy sauce and vinegar, spring onions make a very important addition to everyones favorites, Manchurian and Manchow soup. Even street food vendors use spring onion for vibrancy in dishes like Paneer Schezwan Frankie. Spring onions are so versatile that they can be added to a lot of dishes. Simple subzis like Baby corn and paneer Jalfrazie get an extra texture and taste because of the spring onions. As we know, the subtleness of paneer and sharpness of spring onions go well together. Mixing them together and kneading them in into the paratha makes for a delicious delicacy called Paneer and Spring onion paratha. You can add them to various pakodas and like Moong dal Pakodas to give them a strong taste and to Cheese and Spring onion samosa to complement the saltiness of the cheese. If you don’t feel like having the regular chaat, spice it up with these tasty greens in a Chana Chaat, with a little bit of paneer to change it up. Apart from Chinese, the Mexican cuisine uses spring onions as well. Whether as a garnish or as a part of the main ingredients, it always brings freshness to the plate. You can add it to Nachos or to a Burrito bowl, with Mexican rice, beans, cheese and salsa. Going the fusion Indian route, spring onions make a great addition to a Spicy Paneer burger when added the patty itself. As a hero ingredient, Sweet corn and Spring onion soup, captures the essence and flavor of spring onion very well. Even when mixed with something as simple as dahi, you can make a delicious Yogurt dip, perfect for parties and snacks. Enjoy our spring onion recipes below.